We generate hourly maps of surface currents in the lower Chesapeake Bay using high frequency (HF) radar. View the latest data by clicking on the links in the "Data Products" menu. As part of a regional and national HF radar network, our data is fed to a national website that displays surface currents for large coverage areas along the U.S. East, West and Gulf coasts. Surface current information may be used in a wide variety of applications which benefit the maritime and scientific communities as well as the general public. The data may be applied to search and rescue operations, maritime navigation, pollution tracking, recreation, fishing, and research of coastal ocean processes. Data from this project are freely available to anyone wishing to use it. We are willing to develop special products upon request to help facilitate the development of useful data products for the maritime community. Surface water currents in the lower Chesapeake Bay are observed with the use of land-based HF radar antennas located at three sites: Ocean View Community Beach, First Landing State Park and Sunset Beach Resort on the southwestern tip of the Eastern Shore. 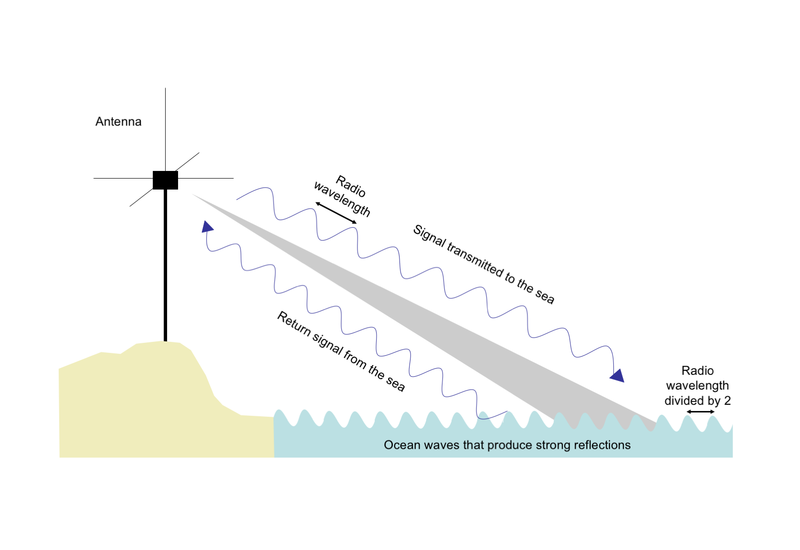 The antennas transmit radio signals across the water and listen for strong return signals reflected off of waves of a particular wavelength (dependent on the transmit frequency). The measured Doppler shift between the transmitted and received signals allows for calculation of an observed speed which represents both the wave speed and the speed of surface currents underlying the wave. Surface current speeds are then computed as the difference between the Doppler-measured speed and the theoretical wave speed based on the deep water dispersion relation. Each antenna site supplies "radials" or current velocity information going directly towards or away from the antenna in all directions. Radial information from two or more sites is combined on a grid in order to produce a 2D map of total current velocities.